By all means, let's talk about patriotism and President Trump's call for "respect for our Country, Flag and National Anthem." At a time when the American flag adorns everything from men's boxers and women's bikinis to beer koozies, bandannas and advertising billboards (with little outcry from the American public), and the National Anthem is sung by Pepper the Parrot during the Puppy Bowl, this conveniently timed outrage over disrespect for the country's patriotic symbols rings somewhat hollow, detracts from more serious conversations that should be taking place about critical policy matters of state, and further divides the nation and ensures that "we the people" will not present a unified front to oppose the police state. First off, let's tackle this issue of respect or lack thereof for patriotic symbols. As the U.S. Supreme Court has made clear, Americans have a right to abstain from patriotic demonstrations and/or actively protest that demonstration, for example, by raising one's fist during the Pledge of Allegiance. Likewise, Americans have a First Amendment right to display, alter or destroy the U.S. flag as acts of symbolic protest speech. In fact, in Street v. New York (1969), the Supreme Court held that the government may not punish a person for uttering words critical of the flag. The case arose after Sidney Street, hearing about the attempted murder of civil rights leader James Meredith in Mississippi, burned a 48-star American flag on a New York City street corner to protest what he saw as the government's failure to protect Meredith. 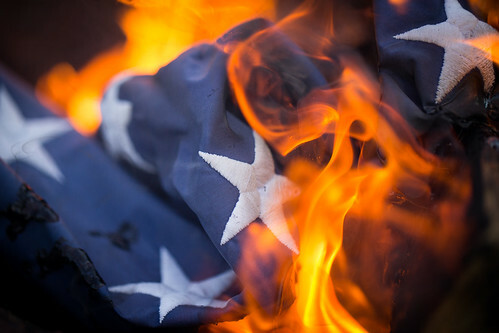 Upon being questioned about the flag, Street responded, "Yes; that is my flag; I burned it. If they let that happen to Meredith, we don't need an American flag." In Spence v. Washington (1974), the Court ruled that the right to display the American flag with any mark or design upon it is a protected act of expression. The case involved a college student who had placed a peace symbol on a three by five foot American flag using removable black tape and displayed it upside down from his apartment window. Finally, in Texas v. Johnson (1989), the Court held that flag burning was protected speech under the First Amendment. The case arose from a demonstration near the site of the Republican National Convention in Dallas during which protesters marched through the streets, chanted political slogans, staged "die-ins" in front of several corporate offices to dramatize the consequences of nuclear war, and burned the flag as a means of political protest. In other words, if freedom means anything, it means that those exercising their right to protest are showing the greatest respect for the principles on which this nation was founded: the right to free speech and the right to dissent. Clearly, the First Amendment to the Constitution assures Americans of the right to speak freely, assemble freely and protest (petition the government for a redress of grievances). 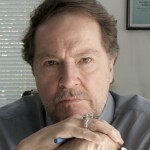 Whether those First Amendment activities take place in a courtroom or a classroom, on a football field or in front of the U.S. Supreme Court is not the issue: what matters is that Americans have a right--according to the spirit, if not always the letter, of the law--to voice their concerns without being penalized for it. Second, let's not confuse patriotism (love for or devotion to one's country) with blind obedience to the government's dictates. That is the first step towards creating an authoritarian regime. One can be patriotic and love one's country while at the same time disagreeing with the government or protesting government misconduct. Indeed, real patriots care enough to take a stand, speak out, protest and challenge the government whenever it steps out of line. It's not anti-American to be anti-war or anti-police misconduct or anti-racial discrimination, but it is anti-American to be anti-freedom. America requires more than voters inclined to pay lip service to a false sense of patriotism. It requires doers--a well-informed and very active group of doers--if we are to have any chance of holding the government accountable and maintaining our freedoms. After all, it was not idle rhetoric that prompted the Framers of the Constitution to begin with the words "We the people." This ultimate responsibility for maintaining our freedoms rests with the people.